The responses to CESR's call for evidence on the use of standard reporting formats are in, and they contain a mixed bag of answers. Of the 33 responses listed, only 31 appear to be valid (one was obviously misplaced, one materially empty). Furthermore, the categorisation of respondents used by CESR looks arbitrary, which is why we've applied our own. Essentially, we were curious whether respondents supported standard reporting (Q1), and if so, whether XBRL would be fit for the purpose (Q2). Q1: Respondents were mostly in favour of standardisation (74%), although a sizeable part (7) of those favourable answers came from the XBRL community. Without them, 67% of responses are still in favour, notably investors, exchanges and service providers. The most outspoken opposition to standardisation comes from the issuers camp, especially (and unsurprisingly) from banking institutions. Q2: Respondents were overwhelmingly in favour of XBRL as the most appropriate format (90%, or 88% without XBRL community). Surprisingly, this even holds true for those respondents who were sceptical about standardisation in the first place. The responses from issuers (EAPB, EBF, ZKA, DAI) are remarkable in that they focus on the lack of effective standardisation (and thus comparability) in today's corporate accounts across countries and industries, in spite of those accounts being prepared under IFRS. They quote local laws and regulations as inhibitors to effective standardisation, which could not be overcome by simply applying the IFRS taxonomy because it did not provide the necessary local concepts, nor could it be ascertained that nominally identical concepts are materially identical in practice. In my view, these issues are known and need to be addressed by means of an appropriate system of standardised extensions of the IFRS taxonomy. 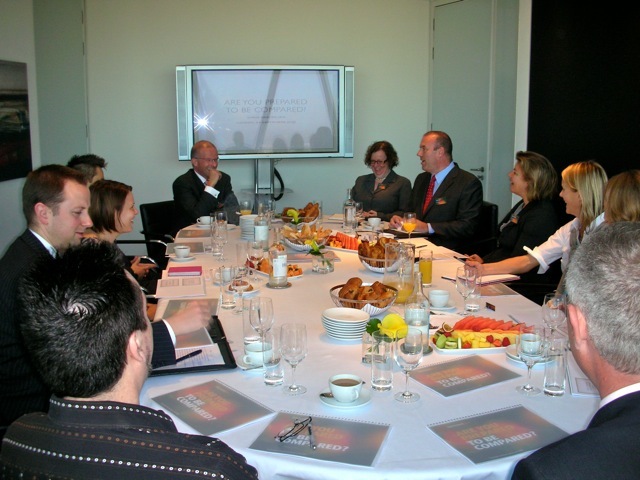 Likemind has produced a nice write-up of the breakfast meeting to which I was invited to present the investor perspective on XBRL to a group of corporate communications professionals on 24 September in London. The event itself was very pleasant with a lot of questions and discussions among participants, and I think this comes across nicely in the conversational style of the paper. Watson Wyatt has just published a short paper on Extreme Risk with an assessment of impact and possibles hedges. Interesting stuff - I particularly liked the reference to Extreme Value Theory and the Association Matrix. The Association Matrix gives hints as to how some reverse engineered risk scenarios might have looked like if the team would have taken some more time to formulate them. Awareness has crossed the 50% threshold (52%) for the first time in the Americas. Interestingly, it is highest among the most experienced Charterholders and lowest among new and non-Charterholders. Highest impact of the usage of XBRL continues to be expected from uploading company data and from comparing companies. There was a marked shift in the types of assurance expected from an integrated to a separate audit for XBRL instances. Unfortunately, we don't have a regional split of that information. It would be interesting to see whether the shift originated mostly in the US, where sensitivities about XBRL specific audit issues are rising. Against my expectations, direct information extraction from source documents is rising at the expense of third party sources. This is consistent with the increased usage of XBRL documents. Too bad we don't have a more detailed analysis of this item. Those of you who read German may be interested in an article I've written for nspublish INSIDE. In its third Report on Market Developments, CEIOPS provides an update of recent developments in cross-border pension funds. Net growth has dwindled to a mere 9% in the reporting period. Notably, there were 4 discontinuations of cross-border activities of IORPs. The report includes little conclusive evidence of the reasons for the slow growth. In particular, the discontinuations were not attributed to the regulatory framework, but anecdotally to reasons specific to the institution in question. Nevertheless, our assumption would be that the uncertainty surrounding the pending revisions of the pensions directive are certainly not encouraging strong growth at this juncture. Doing some research in preparation for a draft answer to CESR's Call for Evidence on standard reporting formats, I was curious to find out how much of the world's capitalisation is already covered by an XBRL mandate. I've thrown together a list of jurisdictions provided by Mike Willis that either already have a mandatory scheme of XBRL disclosure for issuers in operation or decided about its introduction. Using country weights of the MSCI World Index for developed countries (i.e. without China or India and others, both of which have or will soon have a scheme in place), this adds up to slightly above 60% of the "developed" world's equity capitalisation that is already covered by a mandatory XBRL disclosure scheme today. While this is an encouragingly large share, it is still some ways away from the 90+% that I reckon to be necessary to encourage global investors to migrate the information infrastructure of their analytical processes to XBRL. Bringing the EU's market cap on board would bring us substantially closer to that important threshold. Next week, XBRL for Dummies, the long expected reference manual for XBRL by the standard's inventor Charles Hoffman and Liv Watson, its most fervent proponent, will hit the market. We are keen to delve into it! My presentation fest continued this morning with my first Webex enabled online seminar about XBRL to the Association of Corporate Treasurers in Switzerland. Please find below the slides used during the presentation. I've had the honour of addressing the Intergovernmental Working Group of Experts on International Standards of Accounting and Reporting, twenty-sixth session in Geneva yesterday. The subject matter was implementation issues of fair value accounting in an IFRS context. To my great surprise, there was hardly any criticism expressed of the approach, neither from the panel nor from the floor. FT Alphaville points us to a paper "How do hedge fund clones manage the real world? ", comparing the performance of 21 commercially available hedge fund replication products ("clones") in the period between April 2008 to May 2009. While the observation period is inevitably short, it nevertheless contains turbulent markets. The paper's conclusion is thus all the more remarkable, namely that clones perform competitively at a fraction of the cost of the underlying, and without much of the liquidity constraints of hedge funds also. Separately, EDHEC finds the performance of cloning methodologies to be systematically inferior to the real thing. However, this study performs a proprietary cloning methodology. The significance of its finding is thus limited to the quality of those strategies. While being performed over a longer time period, we think that the above mentioned assessment of commercially available products is more practically relevant to investors. These are the slides which I used at the breakfast presentation yesterday, hosted by Likemind at the SwissRe tower in London. Bank Wegelin's most recent investment commentary by the same title is remarkable. It provides an extensive explanation of the US taxation risks involved when investing in US securities as a non-US person. The fact that the status of US-person is left (intentionally?) unclear is of particular concern to Qualified Intermediaries (i.e. foreign banks) because they assume liability for their clients' putative tax liability. This is the reason why Wegelin is actively advising its clients to exit all US securities and may not sign the more rigorous QI Agreement. Wegelin's move receives particular attention in Switzerland because its Managing Director is also Chairman of the Swiss Private Bankers Association. Non-US pension funds (and listed entities) may be eligible to an exemption from a new 30% compulsory withholding tax on US securities held by non-US companies, as explained by the Green Book. While I agree that applying government bond yields to discount pension liabilities makes sense in only a very limited set of circumstances, and definitely not as a generic fall-back position in the absence of a deep corporate bond market, the proposed discount rate suffers one important flaw. The Board argues (BC4) that comparability is served by reducing the range of rates used. Yet, the motive for not just fixing a single rate (maximum comparability in that sense) is probably that this would not reflect economic reality in any sense. But this purpose is not served by choosing high quality corporate bonds, either. What if the reporting entity is not of high quality (which is the rule rather than the exception nowadays)? The liability is overstated. The economically correct discount rate to apply to the valuation of pension liabilities in my opinion is WACC. Cost of capital is calculated for each entity separately and thus cannot be compared uniformly, but it reflects the economic reality of financing decision making. As an analyst knowing about the many arcane ways in which pension liabilities are valued, I don't take the nominal amount of pension liabilities at face value anyway, so that comparison is of little interest. The July/August issue of FAJ has an intriguing article looking at empirical evidence of whether freezing DB pension plans would increase company value. Since cost and volatility impact on earnings are the justifications most often referred to for closing DB plans, the default expectation should be that it would. Yet, the authors cannot find any significant evidence of that. They have been looking at the price reaction in four different event windows of 82 US announcements of frozen / closed DB plans between 2003 to 2007 in various industries. Interestingly, there seems to be a correlation between closure events and the generic business cyclicality of the firm's industry sector. Event firms exhibited stock market underperformance compared to their peers in the years leading up to the event. Results indicate no systematic empirical evidence for positive abnormal returns associated with DB plan freezes / closes. Separating freezes and plan closures exhibits a small, yet unexpected diversion: Plan freezes generated a negative abnormal return, whereas the (small) sample of closures (for new employees) produced a more pronounced positive return. In sum, it seems that DB pension plan closures / freezes tend to be short-term, ineffective measure adopted by managements to counter performance pressure. "And, in the future, a financial firm that is too big or too interconnected to fail must be too big to exist." The Bank for International Settlements Annual Report is probably the only one that I read regularly for its content, rather than mine it for data. It contains authoritative interpretation of recent economic and financial developments, and is thus an important source of consensus narrative. This year's report is no exception. Of particular relevance going forward is its chapter VII, outlining the current thinking about capital requirements by evaluating a Systemic Capital Charge and a Countercyclical Capital Charge. However, these capital charges appear to continue to rely on portfolio theory's (stable?) correlations, which is conceptually flawed, as we now know. Nevertheless, it is encouraging to see that countercyclicality is addressed not with perceptional placebos such as modified accounting standards, but with measures aiming at the economic heart of the matter, namely leverage and the capital base. Last, but not least: if Too Big to Fail were a victim of the crisis, it would have been worth it. The Economist deserves praise for having featured a special report on the impact of ageing populations in this time of crisis, which overrides longer term requirements with its fiscal profligacy. The majority of industrialised countries were already on an unsustainable fiscal path before the crisis struck. It is difficult to see how government finances will ever be able to return to a trajectory that is stable longer-term. It goes without saying that the foreseeable instability of public finances has a dramatic impact on capital funded retirement systems. At this juncture, the jury is still out on the prefix of instability, i.e. whether we will see inflation or deflation. Either way, the contradictory demands on the investment strategy of individual funds are anything but trivial and may need to be implemented consistently in very short order once the dust settles. Scenario analysis and preparation is the name of the game. I look forward to a workshop producing a Shell/Oxford-method scenario analysis on Switzerland 2030, to which I have been invited by the federal crisis management education unit. Today, influential Swiss daily Neue Zürcher Zeitung NZZ has my article on XBRL. Which is perfect timing because of the forthcoming workshop that XBRL CH is organising next Monday. The subject matter of that event is the US SEC's new XBRL regulation, which is applicable for foreign filers as well - so, rather targeted. Back to back, but more generic, is the big XBRL show in Paris, beginning on Tuesday through to Thursday. Interactivity! "A long-term view involves short-term risk, whereas a short-sighted strategy involves increased risk over the long term." EDHEC just released its impressive report Impact of Regulation on the ALM of European Pension Funds. Even though we disagree in some instances, we think this is mandatory reading for anyone in the pensions investment space because it highlights those areas of regulation which will be of increasing consequence for pension funds' investment strategies in the near future, as we have continued to stress over the recent past. At the core of the report is the development of an asset allocation model in the presence of liability constraints. The solution involves the components cash, risky assets and the liability hedging portfolio. The state of the art model takes inflation and longevity risk management into account as well. There seem to be a few at least implicit factual inaccuracies in the parts describing the regulatory environment. The most glaring of which may be the assumption that the EU pensions directive is applicable in Switzerland - it is not. Accounting standards seem to be understood to effectively determine investment action. While it is not unheard of that managements structure transactions in such ways as to optimise their reporting, this clearly goes one step too far. We are well aware of the interdependence between perception (qua accounting standards) and (economic) reality, but at least in an academic report, the latter needs to retain some vestige of predominance over the former. Remember: pension funds' long-term time horizon, as accounting standards can and do change. It is hardly a coincidence that the Federal Office of Statistics publishes a new study about the Future of Longevity in Switzerland (German, French) today. There is an upcoming referendum to decide about the proposed reduction of the transformation rate with which accumulated pensions capital will be transformed into annuities. Longevity expectations are an important factor in that hotly contended issue. The study expects an additional 5 to 9 years of life expectancy gains over the next 20 years with a continuation of morbidity compression. Behavioural finance is a fashionable topic, of course, and an interesting one at the same time. It is useful to be aware, if that's possible at all, of the cognitive limitations of our decision making processes. Yet, I still have to see a useful active behavioural tool for investing - much of those uses seem to be limited to technical analysis. This video reminded me of a similar presentation by Richard Thaler at this year's CFA Institute annual conference in Orlando. The biggest surprise in that presentation was that XBRL featured prominently in it as an important tool for improving financial decision making. P.S. This podcast interview with Ariely gave me some food for thought. There is probably a fruitful tension between the rational expectations axiom and what Ariely calls predictably irrational. It can be a rational to expect collective irrationality. We don't do investment advice on this blog. But all the hopeful talk about green shoots has also provoked this nice Buiter comment. To turn bullish on the news of an inflection point after what may easily have been the world's sharpest inventory rundown in human history requires a foolhardy degree of optimism, given that the economic growth trajectory is no sinus curve - another inflection point may easily occur before we're actually coming across a turning point. Swiss economic semi-weekly Finanz und Wirtschaft had a lead article (in German) by Prof. Straubhaar the other day with which I almost entirely disagreed. In short, he gave international accounting standards a fail because they amplified the financial crisis. He preferred continental accounting standards and does not even mention investor requirements. Unfortunately, this reflects much of the continental European consensus, which is why I wrote a somewhat extensive rebuttal. This was published today. CFA Institute's GIPS are similar to Accounting Standards in that they prescribe in some detail the concepts, requirements and procedures for reporting performance of asset managers' investment vehicles. The purpose of GIPS is to make asset managers' reported performance numbers consistent and comparable across several providers and facilitate manager selection by investors on the basis of the manager's track record. According to the CBRM, financial reporting is made for investors. The same applies to GIPS reporting. Therefore, the same compelling logic that has driven the SEC to mandate the XBRL format for business reporting of all listed entities and mutual funds in the US should apply in the case of (voluntary) GIPS reporting, at least in so far as the premises for XBRL reporting of GIPS numbers should be prepared. In the course of the GIPS 2010 project, it is essential to lay the groundworks for bringing GIPS online, i.e. making GIPS reports even more quickly available and comparable with XBRL. As with financial reporting, the key requirement to enable GIPS reporting using XBRL is a taxonomy. The GIPS taxonomy, like FASB's US GAAP taxonomy or the IASB's IFRS taxonomy, contains all the concepts and relationships of GIPS without impeding the reporting entity's flexibility in disclosing additional items by using its built-in extensibility. Taxonomies are usually created and maintained by cross-sectional working groups of stakeholders under the umbrella of an XBRL jurisdiction. The extent of the effort to build a taxonomy depends on the standard it is intended to represent. In the case of GIPS, it seems natural that CFA Institute takes on the responsibility for creating and maintaining the standard GIPS taxonomy. The availability of a GIPS taxonomy is a necessary, but not a sufficient condition for establishing XBRL GIPS reporting. Preparers and users have to follow suit and establish practice. However, if the example of accounting standards is any indication, it is crucial that the Standard Setter (CFA Institute) endorses XBRL by creating a taxonomy for its standard and thus providing the infrastructure on which usage can be built. As multiple case studies show, deploying XBRL in the reporting value chain of GIPS will result in smarter, cheaper and faster GIPS reports: They are smarter because the validation procedures built into XBRL taxonomies from the start massively reduces errors in reports, thus also reducing the cost of preparing and verifying them. They are faster because they can be made available online immediately and can be compared automatically without re-keying any information. Given XBRL's widespread and quickly expanding application in financial reporting, competing IT tools at all stages of the reporting process are already available and are improved continuously. These tools are usually agnostic of the taxonomy they are applied to, thus they are usable on GIPS reporting. It is easily imaginable that the SEC's Mutual Fund Viewer could be applied to GIPS reports, provided that they collected in a single location online. Perhaps there is another role for the CFA Institute in this? The ongoing parallel development of IT tools handling XBRL formated financial reporting constitutes a very important synergy that GIPS can take advantage of effortlessly. And yet, the Borg are effect-fully resisted in Star Trek. Clearly, GIPS is a well established global standard that works. It is therefore not immediately obvious to practitioners in the field why the plumbing of the process should be changed. Incidentally, there is no recognisable need to move to XBRL at the present. Yet, the transformation of the financial reporting process to XBRL has met and is in the process of overcoming the same resistance globally. The potential gains in transparency and process efficiency are too large to dismiss. Finally, there is another factor that makes the case for adopting XBRL in GIPS even more compelling: GIPS is not mandated anywhere (to my knowledge) and thus fully dependent on voluntary adoption as well as market demand. The availability of a GIPS taxonomy and CFA Institute's encouragement of the usage of XBRL in GIPS reporting would send a clear signal about how GIPS is being future proofed and made increasingly transparent and user-friendly. OECD has an informative recent overview paper Pension Fund Investment in Infrastructure. The author looks at whether or not infrastructure deserves to be classified as a separate asset class (the evidence is inconclusive), risk-return profiles and benchmarks and other key items. But most interesting is the assessment of the barriers to pension fund investments, of which there are a great many. These are probably hard to overcome, except for the best run of institutions. Slightly less globally relevant is the recent availability of the Swiss XBRL Jurisdiction's website. In a recent issue of its flagship publication Sigma, SwissRe described Scenario analysis in insurance, identifying scenario analysis as a key tool to analyse fat-tail risks and their impact on profitability and competitive position of insurers. One of the pioneering sources of scenario analysis is the approach developed by Shell. Whereas scenario analysis is referred to as a key tool for both strategic planning as well as enterprise risk management of insurance, Sigma reports with some degree of astonishment that banks do not use it to assess their total enterprise risk exposure. The Economist Intelligence Unit has just come up with its own bleak exercise in scenario analysis (hat tip Global Guerrillas). 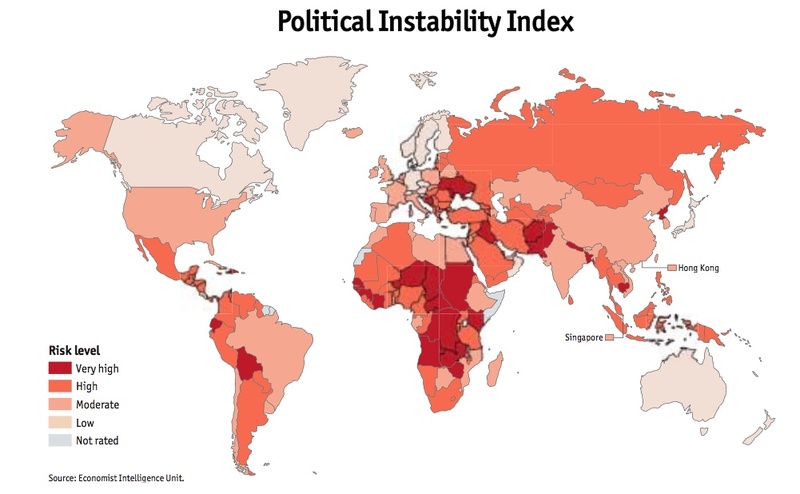 Its central forecast of stabilisation is assigned a probability of just 60%, whereas the more disruptive instability scenarios are assigned 30% (de-globalisation) and 10% (collapse in USD) respectively. Scenario analysis has been posted as a means to escape the tyranny of the present, but being where we are today, we are not so sure this is a good thing. As an institutional investor, we are always interested in informative long-term charts. This one fits the bill, even though it is probably meant to shock today's investor with its implicit statement that there was no money to be made in 43 years of investment in the Dow. However, some qualifications need to be made. The obvious one is that the chart is just a price chart corrected for inflation, but without taking into account the dividend yield, which is probably about 5% p.a. by now. Getting that kind of return on top of real, inflation-adjusted capital preservation on a long-term basis is no mean feat indeed! Until the beginning of this year, Swiss pension funds were obliged to follow a detailed set of investment restrictions laid down in a government regulation, or obtain a formal waiver to deviate from these restrictions. The more sophisticated institutions have made use of that opportunity, which is why what once was supposed to be an exemption now had effectively become the rule. This has changed with the new investment guidelines of articles 49 ff. BVV 2 which have entered into force on 1 January. The number of investment restrictions has been curtailed substantively and the alternatives asset class has been made available. Yet, the government has stopped short of introducing the prudent person rule as there are still a large number of small iorps which appear to feel more comfortable following a prescribed asset allocation, despite their objective needs. That is probably the line of thought that MPs followed who criticised the changed guidelines massively. They seem to think that parliament knows best what an appropriate asset allocation strategy should be. It is unfortunate that even the most moderate of reasonable changes come under political pressure as a consequence of the crisis. Effectively, the new investment guidelines are a reluctant, small step in the right direction. But they clearly fall short of the EU's state-of-the-art Pensions Directive 2003/41 in fundamental ways, most evidently in the restriction on equity investments to 50% rather than 70% as per the Directive. Also, a target return in line with money and capital markets and real estate returns seems to be at odds with member interests. Consequently, it is hardly surprising that the magic triangle of Risk, Return and Liquidity is cut down to a single Risk-Return line. There is also a degree of over-diversification in the prescription that alternatives exposure can only be taken through (expensive) collective means. Finally, there seems to be an editorial error in art. 60, which appears obsolete, given art. 50.4/5 (deleted by subsequent Regulation). There is a lot left to do. Here's to hope that the crisis will not preclude the necessary changes.